We recently made our third donation to the international organization “Wheels for the World”. Wheels for the World’s volunteer group, called Chair Corps, collects used wheelchairs, walkers, crutches and canes. When we found ourselves needing to replace several wheelchairs, our Occupational Therapist, Brian Busch looked for other uses for these unwanted wheelchairs rather than stripping them for parts and scrapping the rest. Brian’s research found Wheels for the World and Kimi and Bruce Archer. The process is quite simple, we deliver our unwanted wheelchairs to the Archers and from there they make the arrangements to have the wheelchairs restored to like-new condition and shipped to countries like China, Cuba, Romania, Ghana, Thailand, and India. 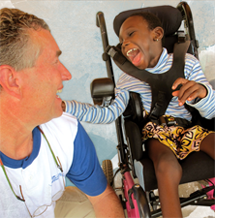 At the distribution sites in these countries, volunteer teams of disability specialists fit each wheelchair to the recipient and provide training in its use and upkeep. Children with disabilities are excluded from life in the outside world because they have no way of moving around. With a wheelchair, these children can finally attend school and become part of their communities and villages.